What's a horse/owner to do as winter sets in? Living in central Texas means that winter comes a little later and is a lot milder than in other areas of the country. Having been blessed with an easy keeper who really requires little fall preparation for the winter and a hard keeper that requires me to start getting her ready for winter now, I have to plan carefully to keep them both healthy. Winter can be a stressful time on many horses. Prepare your horse for the coming cold months. Here is a list of questions you can ask yourself about your horses and the answers will form the basis of your nutritional plan for winter feeding. How much and how hard is your horse going to work this winter? How much grazing will they have access to? Is there snow in your region? What is their current body score? Are they current on vaccinations and worming? In what kind of condition are their teeth? Using Nan as my example for a hard keeper horse, I will answer the questions and then set up her ideal feeding plan. Nan will be off work this winter as she had a quarter crack that required aggressive treatment. We had to cut away the cracked area and support her foot with a specially-made heart bar shoe. So, she will not be expending calories to stay in shape. I have a small pasture, so grazing is non-existent during the winter months and I am going to have to ensure that I have plenty of forage available for her. We rarely, if ever, have snow, however we do get days that are rainy and cold and just plain cold with freezing temperatures. Nan’s body score is currently at about 5.5-6 and I am going to try and push that a little more in the next couple of months as she has a tendency to come out of winter at about a body score of 4 or less, depending on how hard the weather was. Both Nan and Misty are current on vaccinations and I just wormed them on October 1st in preparation for the first cold front of the season which pushed through last night (night time temperature for me was 50 degrees). I blanket Nan as soon as it drops below 60 as I do not want her to have to work at staying warm. She has never been one to develop a heavy coat, so I have three sets of blankets for her, one for 45-60 degree weather, adding another when it drops below 45, and she has a wool under blanket that I put on her when I know that our temperature is going to go under freezing. Her teeth are fine and she is now on a 6-8 month rotation and is not due until March. I buy a 50 lb. sack of wheat bran at the beginning of October as I use mashes a lot when it is cold, which is how I make sure the horses stay hydrated. Colic during the winter tends to be from impactions when the horses are not consuming enough water to keep their gut hydrated, or in the case of older horses it happens because they are not able to masticate (chew) their forage properly. So for both reasons, water and hydration become my primary concern. I also use round bales as my forage as it is just more cost-effective down here to use round bales rather than square bales. I know who I buy my hay from and it is ALWAYS horse and high-quality coastal. Conservative figures state that horses should be fed 1-1.2 lbs. of hay per hundred pounds of horse, so knowing accurately how much your horse weighs is also vital. I figure on 2-2.5 lbs. of hay per hundred weight for Nan. Misty, well, she gets a wee bit of a hay belly during the winter. Since Nan’s injury in 2009 I have her on a hoof supplement, and after some recent research about the lack of proper nutrients in even quality hay, I have made the decision to switch both the girls over to a trace mineral and vitamin supplement that contains the biotin that Nan needs for new hoof development and was figured based on ideal nutritional intake and works even when horses are on quality forage. I also increase Nan’s grain intake from her summer ration, which is about 3 lbs. a day, to 6 lbs. a day split across two feedings. I will also increase her rice bran top dressing from one cup to two cups a day. I check both girls daily with my hands as eye checks are not as effective during the winter when hairy coats distort the true body condition. If I think that Nan is starting to drop weight, I add more forage to her diet in the form of warmed mash beet pulp, usually 2-3 lbs. AM and PM. Of vital importance is water and daily consumption. My girls are not fond of nor do they use salt licks or blocks so I buy kosher salt in the big bags and add about a coffee measure (about 2 tablespoons) in the AM and PM. Note: I ONLY add salt on cold days and by that I mean 50 degrees or less. I worry less on 50+ days. I also dump water in the AM and put fresh water out. They drink better. The only other winter preparation routines I have are that I make sure that all their blankets are clean and repaired. I also thoroughly clean their stalls. I level all the dirt area around the three sided shed. I rent, so I am less in control of the surrounding ground, but I make sure that the mats are in place and high enough to keep them out of any standing water. I pick up manure and clean my pasture and barn on a twice daily basis to keep my parasite problems at a minimum. My round bales of hay are placed on pallets so they are off of the ground and I keep the loose and dirty hay around the bale picked up and the immediate area free of manure. I have found that the more I keep the hay bale area clean, the less likely they are to use the area as a bathroom or sleeping area. Some horses have great immune systems and some do not. Keep an eye on them for health signs, as well; horses are susceptible to respiratory illnesses during winter. The ammonia build-up, mold, and dust inside barns and stables can bring on a variety of respiratory illnesses. Do your best to prevent this by ensuring adequate ventilation and giving your horse plenty of outdoor opportunities to breathe in fresh air. Clean out stalls regularly. Horses are also susceptible to skin conditions during winter, such as rain-rot, bed itch, ringworm, lice, and infected scratches. Keep the horse clean, groomed, and medicated appropriately. 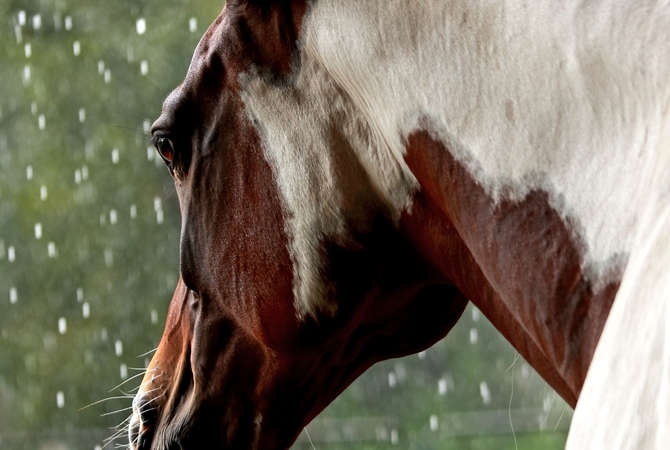 Be careful not to blanket a wet horse or to use blankets that do not breathe but instead cause moisture build-up. After a lifetime of loving horses, Miriam had her first horse at age 41. With Nan she has learned about breeding, foals, health issues, hoof issues, eye issues and is still learning how to become a better riding partner with Nan. She works on this with Nan while riding in Texas Trail Challenges. 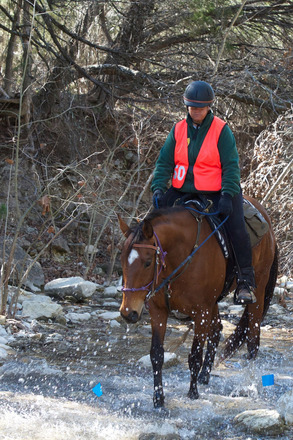 With Misty, her second horse of the herd, she gained confidence on the trail riding in NATRC(North American Trail Ride Conference) and Misty is her go to girl. Her horses are her Zen place in life. Miriam has been writing her entire life and began getting published in her early 20's. All of her work has been of the informative article type and always on topics she has become familiar with in the personal arena first. She currently lives in Central Texas but is looking at a state address change in the near future. She loves writing for Equimed and looks forward to a long future with them. © 2019 EquiMed, LLC. All rights reserved. EquiMed does not provide medical advice, diagnosis or treatment. EquiMed® and Horse Health Matters® are registered trademarks of EquiMed, LLC.